The cherry trees, or sakura are in full bloom right now in Tokyo. It's said that the bloom in Tokyo should be at it's best this couple of weeks. There were alot of people outside today strolling under the trees to enjoy the beautiful light pink blossoms. Tomorrow, and the coming week should be a really good time to get on your bike and cycle around Tokyo visiting several cherry blossom spots. The bicycle is an ideal way of getting aound the city for this kind of purpose. 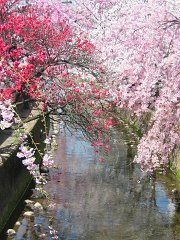 The link below lists some good cherry blossom spots. This page contains a single entry from the blog posted on March 29, 2008 11:51 PM. The previous post in this blog was Spring Approaching. The next post in this blog is Tokyo Century Ride 2008 in Arakawa.